Tommy John was on ESPN radio this morning, and was asked by his co-host for the day about the Hall of Fame credentials of some current pitchers. Maddux, Glavine, and Johnson got a thumbs-up, but Smoltz, Schilling, and Pedro did not. It was clear that John believed the latter three had to get in line behind him. When his cohost tried to float the idea that Smoltz’s many saves should in effect be added to his win total, John pointed out that he had saved a few games himself, implying that such arithmetic would still find him to be Smoltz’s superior (in actuality John compiled only 4 saves). When Schilling’s postseason heroics were mentioned, John said “There’s more to baseball than the postseason.” The last John-rejected pitcher, Pedro, didn’t merit further discussion beyond the stunning one-word denial: Nope. Not long after Tommy John (who as far as I can remember was never the unquestioned ace on his own team) implied that he was a better pitcher than Pedro Martinez, his cohost tried to give him the chance to exhibit a more magnanimous side by asking him what retired player not named Tommy John he would give entry to the Hall of Fame if he could. He chose Bert Blyleven, noting his 287 wins. “One fewer than me,” he couldn’t help adding. 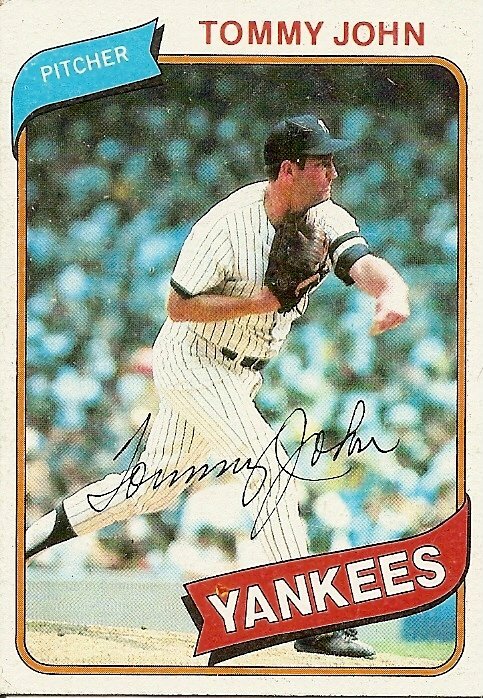 You are currently browsing the archives for the Tommy John (N.Y.Y.) category.